The borders and patterns of The Storyteller (Atheneum Books for Young Readers) have much to say about the stories themselves, and all come from traditional Moroccan carpet patterns. Elizabeth Bird of School Library Journal follows the diamonds in The Storyteller in an article for Fuse 8 Production. “…after each story’s text a diamond appears. However, as the stories appear within stories within stories, the diamonds grow more elaborate and decorative. Then, as the stories end one by one, the diamonds simplify once more. Beyond the borders filling with blue as the stories progress, there is even more to look at! 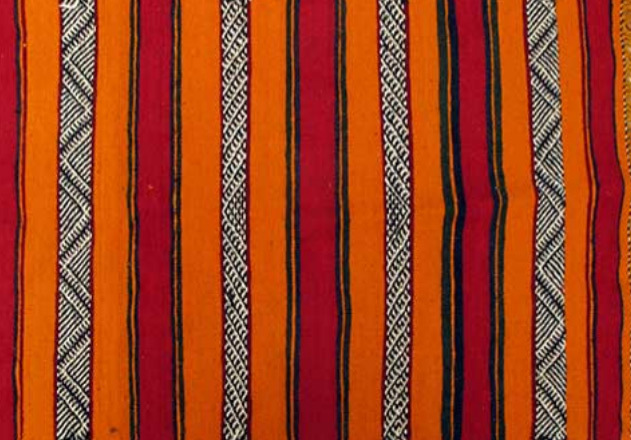 The four colors are very common in Moroccan arts, and have been related to the life cycle of a ripening date (a common fruit from date palm trees around Morocco). The fruits begin green, turn yellow, then to brown, then to black. The colors are also mentioned in association with the colors of “henna”, which is used to decorate Amazigh bride’s skin in traditional wedding ceremonies. The leaves of the henna plant and the paste they make are green. When the paste is applied, it stains the skin black, then fades to reddish brown, then finally to yellow. 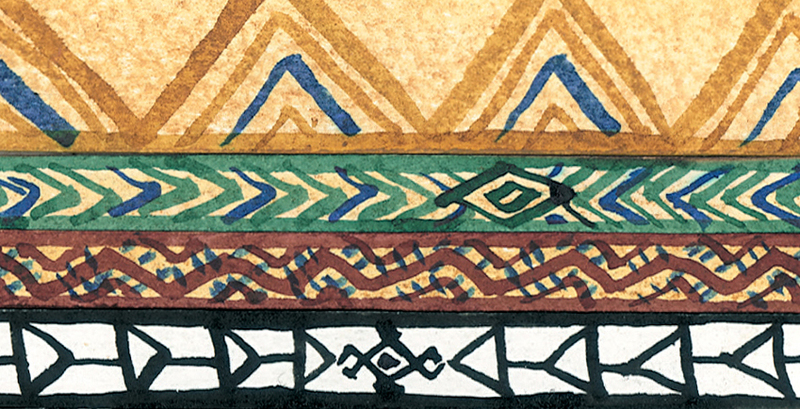 Each pattern is taken from traditional Moroccan carpets, as are the patterns seen on carpets throughout the book. In the image at the top of this post, you can see several different stylized types of carpets from the Atlas region. See if you can spot them in the image! 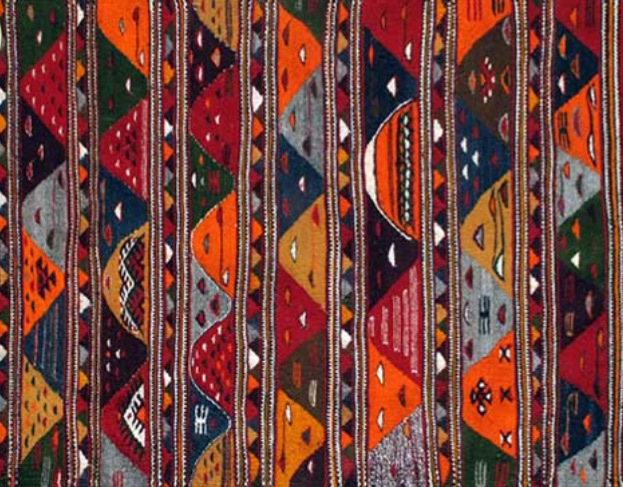 Patterns in Moroccan carpets can mean different things to different regions of weavers, and different things to each individual weaver. The meanings of the symbols also can change over generations, so there is no one “true” meaning that applies to a symbol universally. The chevron pattern can also symbolize female fertility. 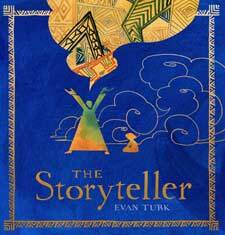 The story of the boy and the storyteller is all about the creation of stories and their ability to protect. The nested tales in The Storyteller all center around women and creation. 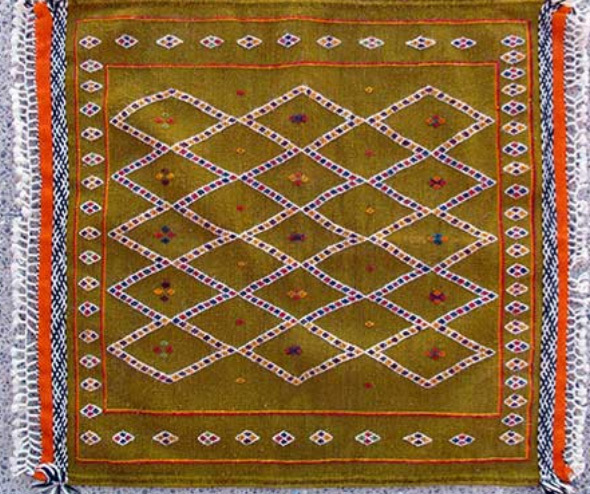 The zig zag pattern can symbolize a snake, an arrow, and male energy, and is often around the border of a carpet, with female symbols (like the female stories in the book) in the center. The triangle pattern can symbolize a snake or male energy, and is also mostly found around the borders, surrounding female symbols. The diamond/lozenge with hooked corners is sometimes called the “spider” (a symbol related to weaving) and can symbolize creation and birth, like the story of the escaped princess.